A few weeks ago I was asked to review the Family Time Fables trio: The Salmon of Knowledge, Fionn and The Dragon, and Cu Chulainn. The books have been written by Wayne Kearns who originally wrote them for his young nieces and nephews, but after receiving interest from extended friends and family, he decided to publish them and they can now be found for sale on Amazon or the Family Time Fables website. I waited for a rainy afternoon when the kids weren’t busy playing in the garden and told them I had a surprise for them. They sat down at the kitchen table and we read through the books one by one. Eva and Dylan both remained silent and attentive as I read through each book. Dylan was particularly interested in the boy Setanta and his hurling skills. Dylan has just started hurling himself and that Setanta killed a dangerous hound with his hound really made an impression on him! As the twins are still only 5, I wasn’t sure how they’d come to terms with the blood and gore – most of their stories like the 3 little pigs have been written to exclude the murder of the little pigs and the big bad wolf, but they both really enjoyed it, especially killing Aillen, the nasty dragon. I did explain afterwards that these stories are just legend, but they knew that they weren’t real! Eva’s favourite was the Salmon of Knowledge. She loved the idea of magic hazelnuts and wondered if we could find a magic hazelnut tree and eat the nuts ourselves. 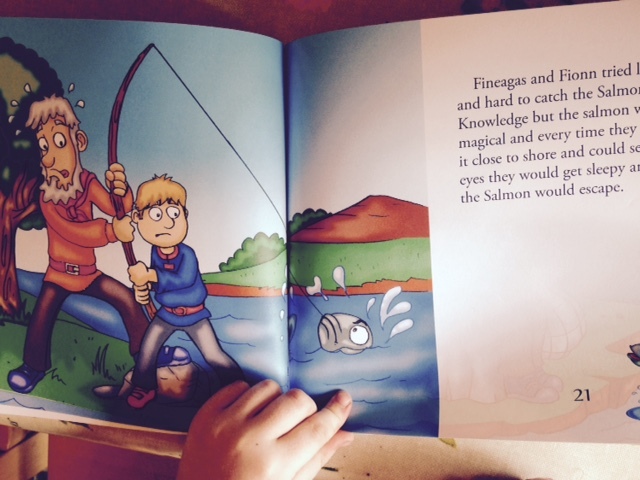 She did ask why Finnegas and Fionn didn’t just eat the magic hazelnuts themselves rather than trying to catch the salmon, which I thought was a wise question from a 5-year-old. When I asked Dylan what he thought of the books, he said ‘they were fantastic. They have good endings because Fionn killed the dragon, and Fionn is best at hurling. He killed the hound too and he got the knowledge from the Salmon of Knowledge’. I asked Eva if she liked the books and she said ‘They were fun and interesting’. I asked what parts were interesting and she said ‘When they boy kills the hound, when the salmon pulls the net when the boy tries to catch him, and when the evil elf king destroys the hall’. So I think it’s fair to say they both loved all of the action involved in both stories and more worryingly, the killing! I wasn’t sure how the kids would respond to the books as we haven’t read them any Irish legends before, but they both really seemed to enjoy them and they do ask for them at bed-time. The stories were nicely illustrated with strong, bold colours by Sherry Heinitz. I liked the fact that the words were of a good size, around about the size the kids are now reading at school, so I’ve encouraged them both to read easier parts by themselves. Some very popular children’s books have the writing sweeping across the page in swirling patterns, intended to compliment or enhance the illustrations and I think this is not helpful to young readers. The writing should be on one portion of the page, with a white background making it easy to distinguish from the images and therefore easier to read. The author also sent us a few colouring books to compliment the collection and these together with the story books have brought the legends to life. The author did explain to me that the copies we received had a few errors in them as these were the first to go to print and these errors have now been corrected. I did come across a few grammatical errors, such as missing commas, inverted commas and can only assume that all of these errors have been corrected. Obviously these are the kind of errors which go unnoticed by young children, but if you’re buying a book for young aspiring readers I’d like the grammar to be perfect. After we had read the books several times, I explained to Eva and Dylan that we were going to review the books and they would need to help by giving me their opinions. They were under the impression we needed to return the books and were delighted when I said they were ours to keep ‘for ever and ever’. Based on that and their obvious enjoyment of the books, I would recommend these books for boys and girls up to the age of 8. I especially like that the writing is of a good size and well presented for young readers. I was given the books for review purposes and have not received payment. Opinions are all our own. They certainly enjoyed them and I think there aren’t many books like this on the market. Very useful review. I especially like your observation about text being presented in a format that makes it very accessible for new readers. The illustrations you shared are very enticing – reminds me of a children’s Bible my kids received when they were young. It got a lot of use because the illustrations helped the kids locate stories they were interested and then tell the stories, even before they were able to read.